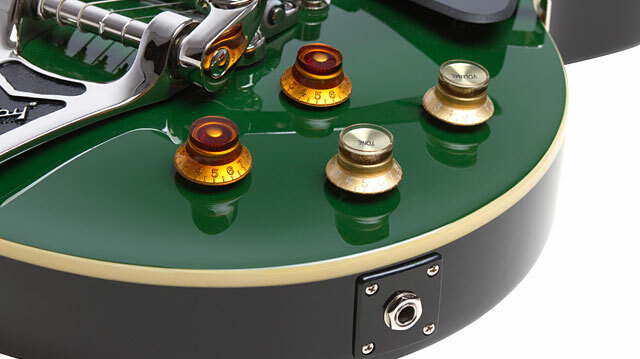 With Bigsby® B70, Gibson® Burstbuckers™, and custom Inverness Green finish! Modern blues legend and GRAMMY™ nominee Joe Bonamassa returns with his third Epiphone Signature Model, the new Epiphone Ltd. Ed. "2015" Joe Bonamassa Les Paul Standard w/Bigsby® Outfit. 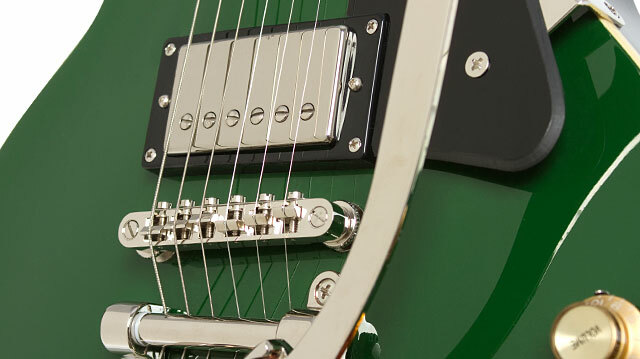 Featuring a one-of-a-kind Inverness Green color finish, Gibson® Burstbucker™ humbucker pickups, and a classic Bigsby® B70 vibrato along with a Les Paul-classic “Lifton” style hard case. Joe Bonamassa has been part of the “House of Stathopoulo” family since 2011 and worked closely with Epiphone’s luthiers at the Epi headquarters in Nashville to create a new Les Paul Standard that incorporated his favorite features from his collection of priceless vintage Les Pauls from the late 50s, this time with a Bigsby® B70 vibrato!Over the last decade, Joe Bonamassa’s original fusion of electric blues and rock has inspired a new generation of fans and musicians. Bonamassa is not only a superb and prolific artist but also a genuine music fan—deeply committed to the story and heritage of the many players who have inspired his sound, from Rolling Fork, Mississippi to London. Bonamassa’s extraordinary technique and passionate performances have already inspired two signature Limited Edition Epiphone Les Paul Standards, the “Goldtop” and the Les Paul Standard in Pelham Blue. Now, Bonamassa adds a new twist with the Epiphone Ltd. Ed. "2015" Joe Bonamassa Les Paul Standard w/Bigsby® Outfit, the first Epiphone Les Paul signature model with the classic Bigsby® B70 vibrato, especially chosen by Joe to match his own prized vintage Les Paul! Like all Epiphones, the Ltd. Ed. "2015" Joe Bonamassa Les Paul Standard w/Bigsby® Outfit comes with Epiphone’s Limited Lifetime Guarantee and world famous 365/24/7 Gibson Customer Service. You don’t have to have a vintage Les Paul to sound like Joe. Play a Ltd Ed "2015" Joe Bonamassa Les Paul Standard w/ Bigsby® Outfit today at your Authorized Epiphone Dealer. The new "2015" Joe Bonamassa Les Paul Standard w/Bigsby® Outfit was designed in close cooperation with Joe and includes many of his favorite design details drawn from his collection of vintage Les Paul Standards--designed by Mr. Les Paul himself to “sustain for days.” The “2015” has a Mahogany body with the same classic “Les Paul” profile used on all Les Pauls since they were first produced at the Gibson/Epiphone factory in Kalamazoo, Michigan. The top has a Carved Maple Cap and is finished in Inverness Green at Joe’s request. The traditional Mahogany neck has a rounded D-profile with a “1959” shape modeled after Joe’s favorite ’59 Les Paul Standard and is deep-set into the body and hand-glued. The neck has a 12” radius with a with “Trapezoid” inlays, a standard 24.75” scale length, 22 medium jumbo frets, and a standard 1 11/16 nut. 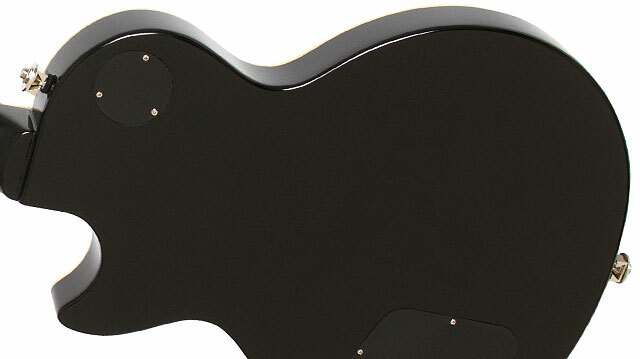 The truss rod cover has the now familiar Les Paul “bell-shape” with “Bonamassa” engraved in capitol letters and the trademark “Les Paul” signature in gold on the headstock. Joe Bonamassa has counted on Gibson Burstbucker humbuckers for all of his Epiphone signature models as well as his rare custom models. Nothing else comes closer to the sound of late 50s hand-wound “PAF”-style humbuckers than Gibson USA Burstbuckers. Joe’s new “2015” Epiphone Les Paul features a Burstbucker-2™ in the neck position a slighter hotter-wound Burstbucker-3™ in the bridge position. There’s no better match-up than a Les Paul with humbuckers and just like the originals, each Gibson USA Burstbucker humbucker has its own individual “voice” enabling players to develop their own person tone and style. The original humbucker was first invented and perfected at the Gibson/Epiphone factory in Kalamazoo, Michigan. Burstbuckers feature unpolished magnets and non-potted coils like the first generation of humbuckers. The myriad of variations in the output and tone of original “Patent Applied For” pickups came from inconsistencies in winding the bobbins, a result of the lack of automatic shutoffs on Gibson's winding machines in the late 1950s. Seth Lover, who invented the humbucker, recalled that original “Patent Applied For” pickups were wound "until they were full." When two coils in a pickup have a different number of turns, that variation puts a little "edge" or "bite" on the classic humbucker sound. Controls for the new Ltd. Ed. Epiphone "2015" Joe Bonamassa Les Paul Standard w/Bigsby® Outfit feature the now-classic set of mismatched Gold “Top Hat” knobs for the bridge and neck pickup controls, just like Joe’s favorite ’59 Les Paul Standard. Epiphone's patent-applied-for LockTone™ Tune-o-matic bridge and the rock standard Bigsby® vibrato along with premium Grover™ machine heads with a 18:1 tuning ratio, make set-up and intonation easy and rock solid. 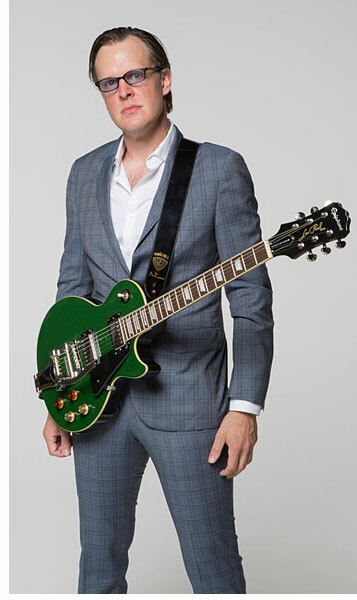 And of course, the Joe Bonamassa “2015” Les Paul comes with Epiphone standard solid Nickel hardware, an Epiphone non-rotating ¼” output jack, and Epiphone StrapLocks. 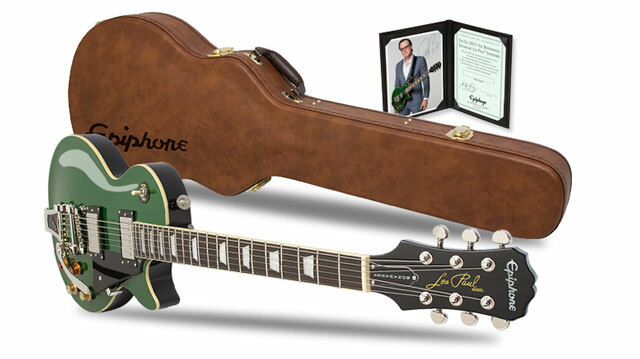 To complete the look of Joe’s priceless vintage Les Pauls, Joe’s new “2015” Epiphone Les Paul comes with a classic “Lifton Styled” Hard Shell Case along with a Certificate of Authenticity hand-signed by Joe Bonamassa.